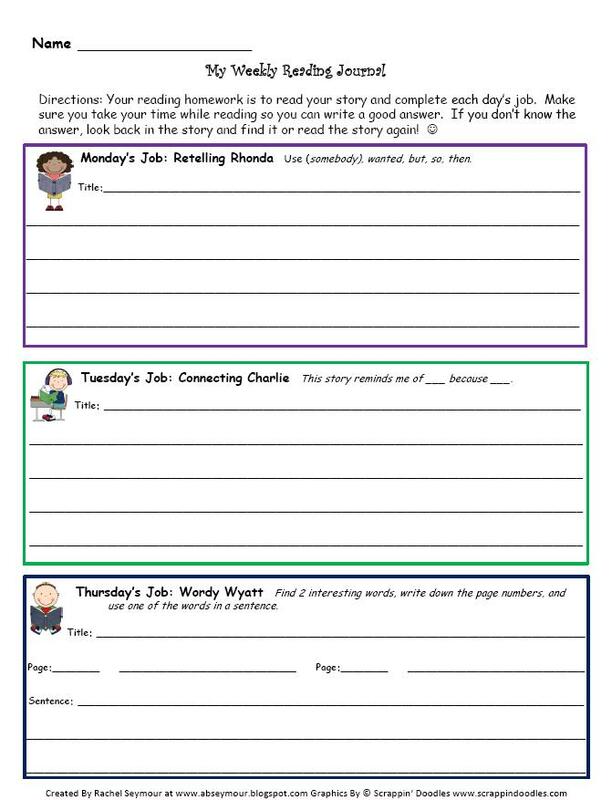 A - B - Seymour: Wonderful Aide, Freebie Reading Journal, and Daily Five Ideas! 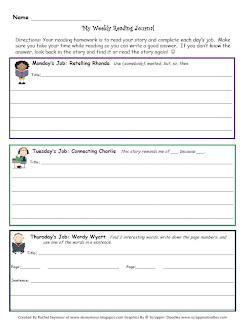 Wonderful Aide, Freebie Reading Journal, and Daily Five Ideas! I was asked a few questions about my Poetry Covers/Table of Contents and Literature Pack, so I'll try to explain. My kiddos just have a regular 3 prong folder this year for their Poetry Notebook. They are now able to put in each poem on their own. That does take quite a bit of modeling and help at the beginning of the year. Now, they got it though! :) Next year, I will look for a more sturdier folder/notebook to use that will hold up better. Some of my kiddos' notebooks are in really bad shape at this point in the year. :( As many of you know, first graders can be tough on things! 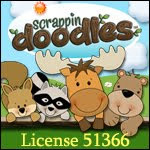 My Literature Pack is for sale at my TpT store! You can purchase the chapter book and the picture book pack individually or you can buy the combination of both for a discount! My AMAZING aide at school, Mrs. Justice (I asked her permission before giving her this shout out!) helped me put my Lit Pack goodies together! I've posted a couple of 'orangey' pictures because I'm not a photographer as much as I would like to think I am pictures below of my posters, bookmarks, and guided reading sticks. Mrs. Justice glued the goodies to matching colored construction paper, laminated them, and then cut them out for me. This is what they look like when I show them to my kiddos! The first thing they wanted to know was if they would all get a bookmark....so easily pleased!! I'm also posting my current Reading Homework Journal that goes along with my Lit Packs. I'm posting this for free, but please follow my blog, grab my button, follow me on TpT, or leave a comment for me if you use it! :) I don't give homework on Wednesdays which is why there is no Wednesday on this copy. I will be creating another Homework Journal for Monday-Thursday soon. My kiddos will take a book home, read it, and then do the job of the day. Right now Monday night's homework job is Retelling Rhonda, Tuesday night's job is Connecting Charlie, and Thursday night's homework is Wordy Wyatt. One last thing before I go....I'm finding some absolutely wonderful blogs to admire and follow and I found this great idea from Ali at An Education Lasts a Lifetime and wanted to share it! We are BIG fans of Daily Five at my school (my kiddos LOVE it) so I'm always looking for new ideas. Ali shares that during Work on Writing her kiddos get to choose 5 stickers to start a picture. Then, they add more details and write a story to match their stickers! I think that is such a clever idea- love it! Your blog is wonderful! I am so happy to be your newest follower! I am a 1st grade teacher too! Hi Rachel - I love your blog..it's so cute. We had a student at our school named rachel seymour and she was awesome! :o) I teach first also in CA. Hi Rachel - welcome to bloggy world! Your blog is too cute! I love all your reading goodie. Can't wait to see what you have in store : ) I'm your newest follower. Hey, I just found your page from Second Grade Sugar & Spice, and I'm your newest follower! I LOVE Alicia, she's awesome!